When it comes to Mexican restaurants, Dublin has some of the finest. From fast food spots like Tolteca, Boojum and Pablo Picante to cooler, fancier places like 777 and Tuzo Mexian Kitchen. Xico, however, is in a league of its own when it comes to super tasty Mexican food and drink. 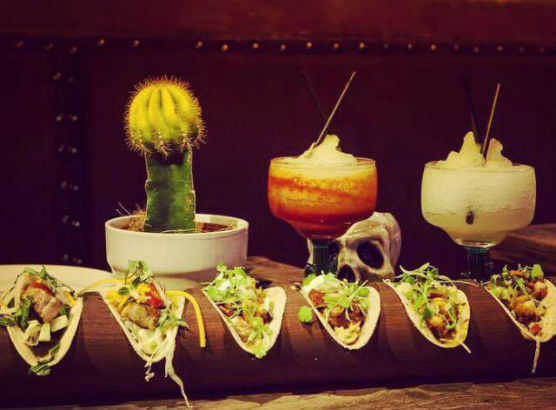 Located in a basement on Lower Baggot Street, you won’t miss Xico with its fluorescent green and yellow signs. Upon entering, your eyes will take a few moments to adjust to the darkness of the dimly lit, ominous wooden tavern, which is reminiscent of the drinking houses from movies like Pirates of the Caribbean. The walls behind both bars are lined with glittering bottles of exotic spirits. On each table sits a candelabrum dripping with months worth of multicoloured candle wax and lamps made from bottles of Patrón. The biggest appeal of Xico, besides their delicious food, is their Monday nights which feature a live DJ, groovy tunes and half price on all food and drinks. After a simple membership sign up you are given a beautiful golden cactus keyring which is your key to an unforgettable Monday night. The hilarious and aesthetically pleasing staff encourage you to dance on the tables and after a few drinks that’s exactly what you’ll be doing. Hour by hour the lights dim and the music gets louder, transporting you from a dark Mexican tavern to an insane nightclub/dance bar, packed with bodies from wall to wall. For food I would recommend the Chicken Tingo taquitos, the grilled/slightly burned corn on the cob with coriander pesto and mexican rice. Their food is served tapas style, in smaller portions, so order a few for yourself and share with your table. Add in some chips and guacamole for while you wait, although the food is served quickly. On a normal night these dishes would set you back €19 in total but on a Monday I paid just €9.50. The food is light, yet filling. A perfect feed for going on the drink. When a half price frozen margarita comes to just €4 make sure you try every flavour. My favourite is the prickly pear. Their famous Mexican Bulldogs are amazing and consist of a bottle of sol sitting upside down in a frozen margarita. The club usually closes around 4am, with drinks being served until 3am so be sure to make the most of that discount.